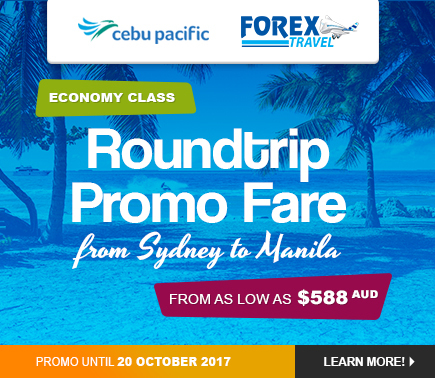 Cebu Pacific from Sydney to Manila Promo Until Oct 20, 2017. CEBU PACIFIC ROUNDTRIP PROMO FARE FROM SYDNEY TO MANILA! Remarks: Sales of this promotion are final and are strictly NON-REFUNDABLE and Non-reroutable. Rebooking permitted with corresponding penalty but not rebookable to another promo fare. Strictly Book and Buy Basis. Rebooking must be done more than 4 hours before the estimated time of departure(ETD). Fare and taxes will be considered flown when flight changes are made within 4 hours from the estimated time of departure and any time after the estimated time of departure. All promo fares are subject to seat availability. Very limited seats only, so BE QUICK! ***All fares are return and inclusive of taxes.